August 24, 2010, Canon Inc.
TOKYO, August 24, 2010—Canon Inc. announced today that it has successfully developed an APS-H-size*1 CMOS image sensor that delivers an image resolution of approximately 120 megapixels (13,280 x 9,184 pixels), the world's highest level*2 of resolution for its size. 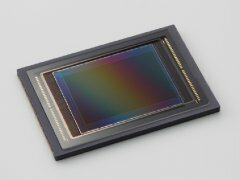 Canon's newly developed CMOS sensor also incorporates a Full HD (1,920 x 1,080 pixels) video output capability. The sensor can output Full HD video from any approximately one-sixtieth-sized section of its total surface area. Images captured with Canon's newly developed approximately 120-megapixel CMOS image sensor, even when cropped or digitally magnified, maintain higher levels of definition and clarity than ever before. Additionally, the sensor enables image confirmation across a wide image area, with Full HD video viewing of a select portion of the overall frame. *1 The imaging area of the newly developed sensor measures approx. 29.2 x 20.2 mm. *3 Canon's highest-resolution commercial CMOS sensor, employed in the company's EOS-1Ds Mark III and EOS 5D Mark II digital SLR cameras, is equivalent to the full-frame size of the 35 mm film format and incorporates approximately 21.1 million pixels. In 2007, the company successfully developed an APS-H-size sensor with approximately 50 million pixels.